The dummy launcher trains your dog to work to shot under conditions of control. Also helps the dog get used to the sound of gunfire. The dummy launcer trains your dog to work to shot under conditions of control. Easy to operate. Issued with full user instructions. Fitted with a recoil handle and includes a choice of canvas or pvc launcher dummies. Uses .22 cal blanks. The dummy launcer trains your dog to work to shot under conditions of control. Easy to operate. Issued with full user instructions. Fitted with a recoil handle and includes a choice of canvas or pvc launcher dummies. Uses .22 cal blanks. Image for illustration only. Available with either a red, white, green or orange canvas dummy. Available in colours red or white. 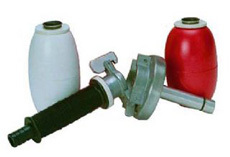 The PVC launcher dummy is oval shape. The launcher dummies have been designed so they float on water and can also be used for working on land. Available in colours red or white. 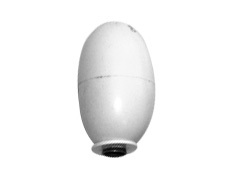 The canvas launcher dummy is shaped like a hand thrown training dummy with a softer feel to the dogs mouth. The launcher dummies have been designed so they float on water and can also be used for working on land. Plastic and grey in colour. Enables the launcher to be fired from the shoulder. Easy to use. Instructions included. Simple pull over the canvas launcher dummy and fasten with Velcro to keep secure. Try firing the launcher dummy along the ground, simulates a bolting rabbit. The Teal launcher dummy simulates dead duck in the water. Simple pull over the canvas launcher dummy and fasten with Velcro to keep secure. Set of 5 spare O-Rings for the dummy launcher.